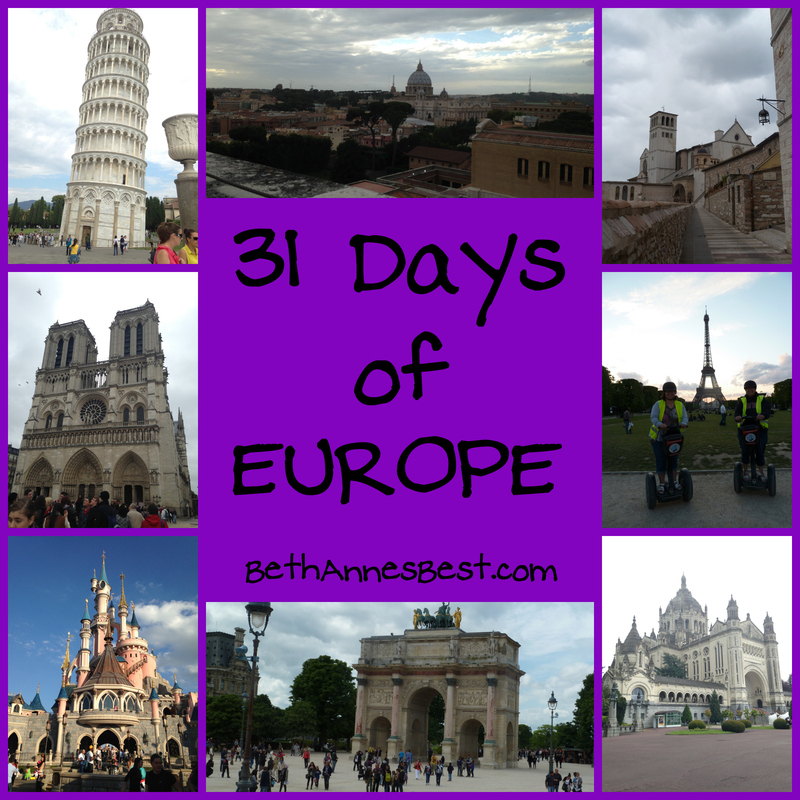 This is Day 3 of my 2014 trip to Europe. If you want to read the other posts about my trip go here. This was our FIRST official day touring in Greece. 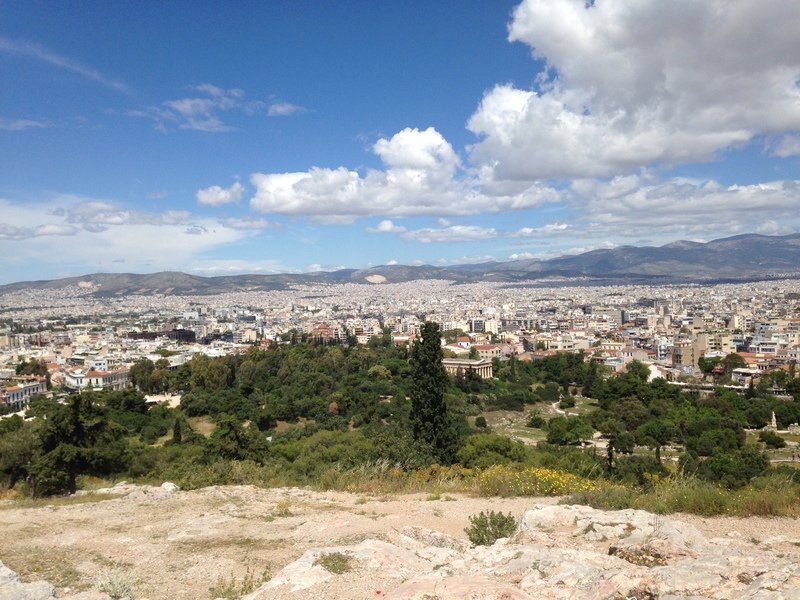 Today on the Agenda was a walking tour of Athens, which included walking up the Acropolis. After breakfast our local tour guide (Dionysus) met us at our hotel to start our tour. As we walked around the Promenade he told us that it was built to go around the city for during the 2004 Summer Olympics. Since we were staying on the promenade we figured out if we ever got lost to find the promenade and follow it around and eventually we would find our way back to the hotel. We told Dionysus some of the things we wanted him to show us including the Acropolis, the Ancient Agora, and the Plaka region. 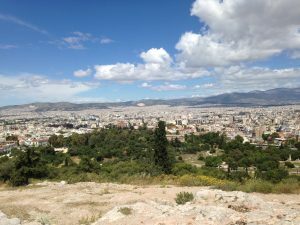 He suggested we head to the Acropolis first before we got too tired. 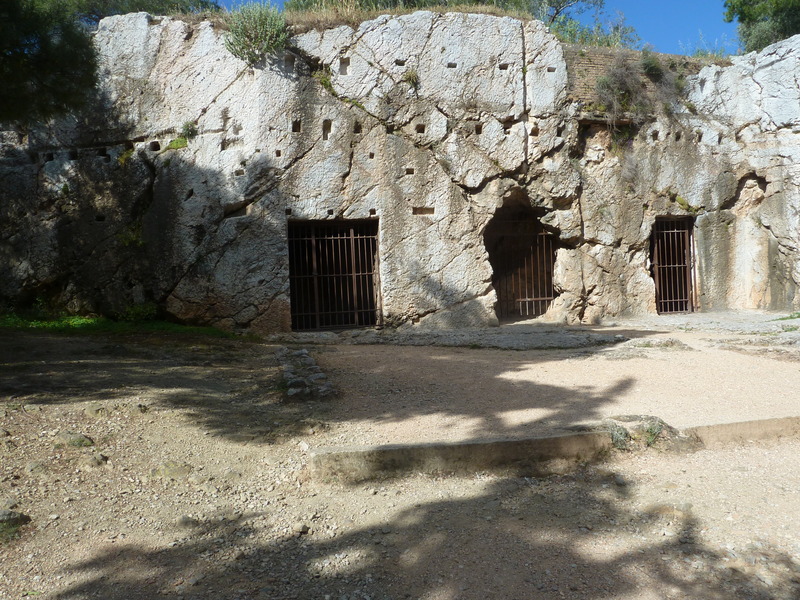 On our way we saw Socrates Prison. You could really tell in the rock how it was used as a prison and where stairs were at one time. I attempted to take a photo with SOTG in the jail but my photo skills failed me. As we took the path up to the Acropolis we started seeing a lot more people. There were many tour groups as well as school groups visiting the site. 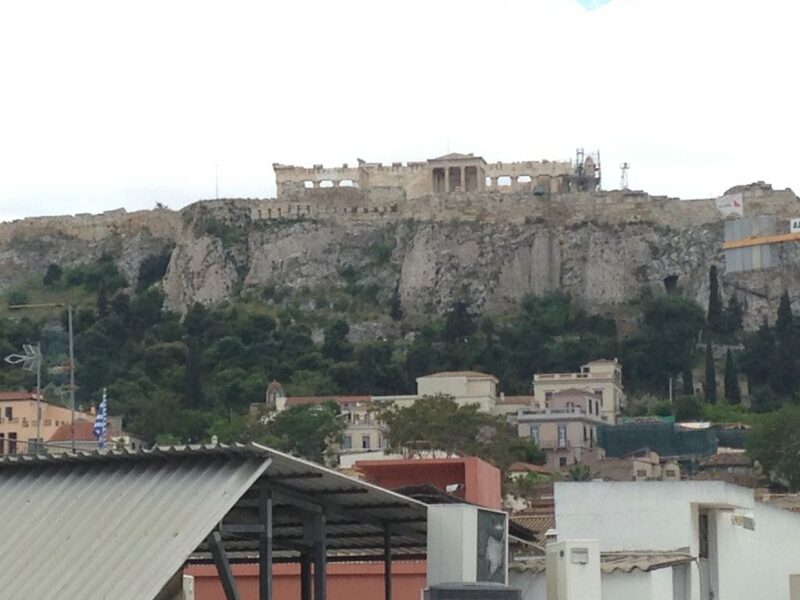 As we climbed up the acropolis our tour guide told us different facts in different places. He let us stop in certain places to take photographs. The view from the top was breathtaking. It looked just like it does on TV with all the white buildings. I also noticed you were very close to the clouds and the clouds looked very fluffy and pretty from the top. You can also see the mountains in the distance. I actually had no idea there were so many mountains in Greece. I have taken many Geology and History classes and have learned about mountains but Greece is never one of the places they focus on. However, I was able to take the knowledge I learned about in those classes and apply it to the mountains I saw in Greece. You can’t tell from the bottom of the Acropolis but most of the flooring of the acropolis is made of marble and it was very slippery in certain spots, many of us almost fell a few times. I wasn’t expecting that at all. One of the most interesting things about the Acropolis is that it was built to look like an optical illusion. From the bottom it looks very far away but in reality it isn’t that far away. The different layers of the marble were built in such a way to make it appear to be further away. I thought that was a really interesting concept that they used to build the acropolis. 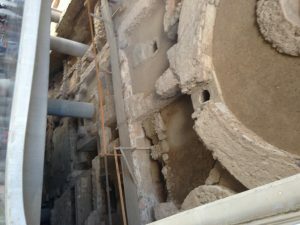 They are constantly doing renovations to restore the acropolis. They were working on it the day we visited and you can see in one of my photos below how they are restoring the columns. It shows that they care about their history and want to keep it nice for years to come. For lunch we ate at a restaurant that had a view of the other side of the Acropolis. A lot of the restaurants in Greece had views like this and it really added to the atmosphere. The two most popular foods in Greece were Greek Yogurt and Feta Cheese. I actually am not fond of Greek Yogurt in the states but the Greek yogurt we had in Greece was DELICIOUS. Above is what I had for lunch. It was beef in pita bread covered with Greek yogurt. It was delicious. After lunch our tour guide led us to the Acropolis Museum where we said our farewells. This museum is fairly new and was a grand site to see. When it was being built there was a lot of controversy because they built it on top of the archeological site of Makrygianni. On the bottom floor of the museum you can see this ruin when you look down. I have been to a lot of museums and I don’t think I had ever seen a museum built like that. To be honest was I was walking through this museum I didn’t think it was that unusual compared to other museums I had seen. There were a lot of artifacts and sculptures and they explained where they were found and it connected the original acropolis to the items. I’ll also be honest by this point in the day I was pretty tired. I’m not used to doing that much walking and physical activity. Then we reached the third floor of the museum and WOW. The outer walls of the third floor were glass and you had the perfect view of all angles of the acropolis. At the top of the wall they had a timeline of the part of the acropolis you were looking at and what had happened to that section of the acropolis over the years and how it changed. I followed the timeline all around the top floor several times in awe. I found that really fascinating. Sometimes when you view ruins of buildings you forget that at one point the building was more than a ruin and a fully functioning building or civilization. We had a big first day of touring. After the museum we went back to the hotel and got ready for dinner, ate dinner, and headed back to the hotel for an early night as we had an early wake up call the next day to head to SANTORINI! !